In today's rapid information technology era, the security of voters’ information is vital and the responsibility of the election staff to equipped with modern techniques to effectively fight against the cyber crimes. 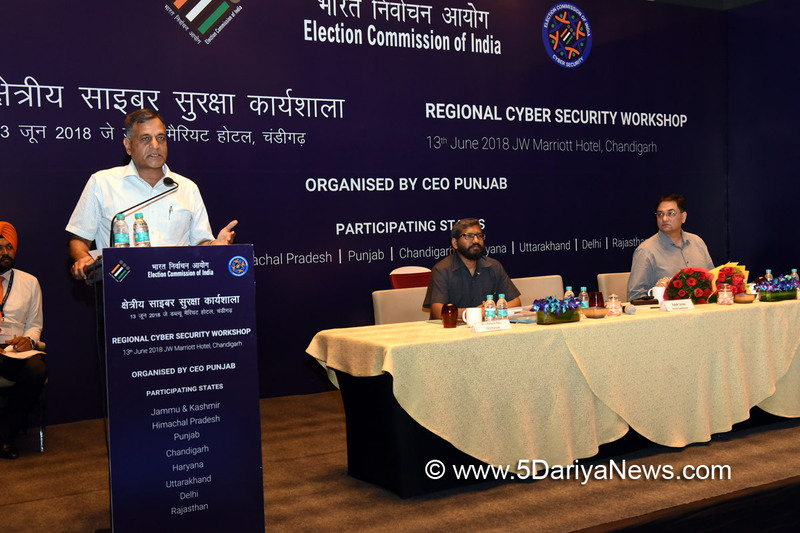 This opinion was formed in unison by the experts and election staff during the Regional Workshop on cyber security, concluded here today.One-day workshop to safeguard and secure voters' information data and to make its officials aware about security measures was organized by the Chief Electoral Office, Punjab. In this workshop, the Chief Electoral Officers of eight northern states; Punjab, Jammu & Kashmir, Himachal Pradesh, Chandigarh, Haryana, Uttarakhand, Delhi and Rajasthan, Deputy Commissioners, Additional Deputy Commissioners, EROs or AEROs and technical staff took part. This Workshop was inaugurated and presided over by Mr. Ashok Lavasa, Election Commissioner of India.In his key address, Mr. Lavasa said that accumulation of data of eligible voters of the country is important for the Election Commission, but at the same time more important is to keep the collected data safe. “As this data is linked with the security of the country, so all of us have the enormous responsibility to work in tandem with the aid of the latest techniques to protect it from hacking or theft,” he added. Mr. Lavasa further said that while using modern technology the election staff has the duty to maintain the sanctity of the election system. He also said that technology is the friend and foe at the same time and we just have to be alert and aware. Welcoming the Election Commissioner of India and election staff to the workshop, Chief Electoral Officer, Punjab Dr. S. Karuna Raju shed light on the motive of the workshop. He said that the advent of modern technique has made every work smooth while on the other hand it has also created many modern types of threats. He said that incidents of data stealing and hacking of websites of several organizations around the world have taken place and keeping this in view, this workshop is being organized to sensitize election staff aware about the new communication tactics.In various sessions, IT experts shared information on various topics and explained ways to safeguard data from cyber attacks. The Chief Information Security Officer expressed his views about classification of Information sensitivity of IT applications, types of information in ERONET, NVSP and conduct of Election Applications and salient provisions of Cyber Security Regulations and Role of Election Staff, while Ms. Ruchi Gola, Scientist- D, CERT-In apprised the election staff about types of cyber security attack mechanisms; Phishing, Man-in-the-middle, Malware, Trojan etc., Mr. Syed Hasan Mahmood, Scientist-B, NIC CERT spoke on the subject on how to secure your IT applications; Safe practices for preventing hacking of Election IT applications, Email Security Policy and Policy for Use of IT Resources, Mr. Rahul Kumar, Project Engineer (Web applications security specialist), CDAC Mohali spoke on how to prepare for eventuality and cyber disaster, how to identify and follow up actions, auditing of IT applications, maintaining audit trail and management of outsourcing staff and Experts from InfoSec Awareness & Education Division of MeitTY, Goi expressed their view about how secure yourself in cyberspace: Practical training and hands-on for protecting your password, mobile and pen drives and applicability of Cyber laws of Election Process; How various provisions can be used to prevent cyber attacks in ERO/DEO/CEO offices.At the end of the workshop, on cyber security subject there was a panel discussion of experts from all the participating states and experts from Delhi, which included representative from HoG NIC CERT, CERT-In, ISEA MeitTY, CISO, besides CEOs of Jammu & Kashmir, Himachal Pradesh, Punjab, Chandigarh, Uttarakhand and Rajasthan took part as panelists.